Welcome August and welcome college application season! 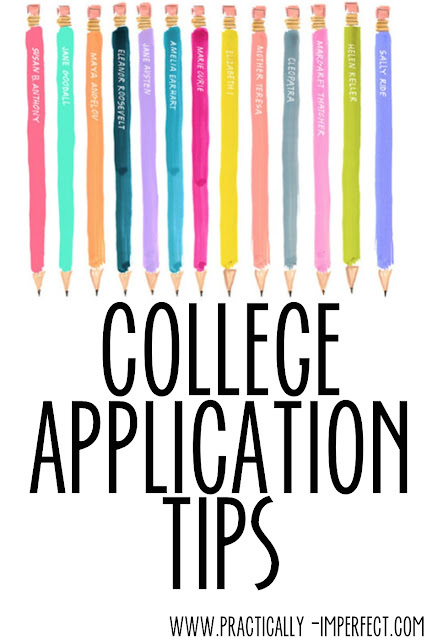 After completing eleven applications last year, I had practically memorized the Common App website and definitely picked up useful tips for the application process. With most college applications now released, I thought I would share a few tips that would have been so helpful to know at this time last year! College applications are about capturing what you, as a student and a person, are all about. In addition to staying focused academically, hone in on a few passions instead of a multitude of interests. It is much more impressive to see that you've taken on leadership roles, spearheaded projects, and essentially made a difference in a couple areas. Don't try to fake it or get involved in a billion extracurriculars just to look good on the application. Do things in life/school that genuinely interest you and I guarantee it will translate well on your college application. Brainstorm personal statement topics and make time to free write when you feel inspired. Tour many different types of schools and decide where you could actually see yourself going. Ask for recommendation letters from your teachers, bosses, and other mentors months in advance so that your letter is the first they write and isn't generic. Keep your resume updated so that you can easily transfer all of your activities to your application. And lastly, as boring and time consuming as it can be, actually study for standardized testing! I was able to bring my SAT score up by 200 points thanks to those lovely little practice tests! On the left side bar of the Common App website, I sorted the schools I was applying to in order of their due dates. That was great for quickly referencing, but I also had a much more detailed list of deadlines physically written out on in my day planner. I highlighted things as I completed them. This includes deadlines for submitting test scores, transcripts, and any additional information a college may have asked for. Have three people you trust proofread your application. If you have many more review your application, critiques and notes can become a bit overwhelming. Before you submit, proofread one more time by reading every section of your application word-for-word out loud and slowly. Trust me; I picked up two mistakes (a digit wrong in my phone number and a word missing in my essay) by doing this. Make it a personal goal to submit your application one week before it's actually due. That way if you forget to do something or make a mistake, you will still have time. I don't think I'll ever forget when I hit the "submit" button on my first college application! I'm not going to lie, it's stressful to let go of something you've worked so hard on and give up that control. Celebrate your marathon of applications with a cupcake, have faith, and trust in what's meant to be. If you put in the work, you will end up where you're supposed to be! I applied to eleven schools and was accepted to ten. Everyone has a unique experience with college admissions, but for me, each acceptance letter felt like the biggest affirmation that the time, energy, and countless essay drafts had been worth it! To those beginning this crazy, busy, exciting journey, I wish you the best of luck! The college admissions process is like nothing else, and it marks the beginning of such an exciting chapter of life!